All Samsung Galaxy S8 stock apps are now available for download. 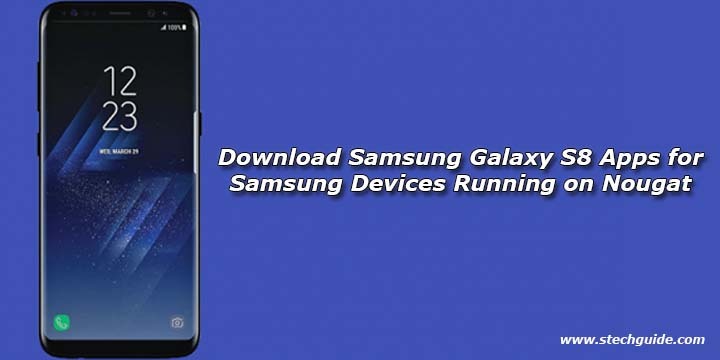 Here we share the direct link to Download Samsung Galaxy S8 Apps for Samsung Devices Running on Nougat. Galaxy S8 will be released later this month but the XDA contributor Albe95 already ported out the apps that will be pre-installed on the Samsung Galaxy S8. The device comes with latest Android 7.0 Nougat which includes all latest updated apps and launcher. Download Samsung Galaxy S8 Apps for Samsung Devices from below. We provide you the link to Samsung Galaxy S8 Stock apps. These apps come preloaded on new Samsung Galaxy S8. These apps are almost similar from the apps which we have seen on Samsung Galaxy S6 and S7 when considering the functionality. Only notable changes are the user interface and the new tab for favorites in the Music player. The Galaxy S8 Touchwiz apps include Samsung Galaxy S8 Music app, Galaxy S8 Voice Recorder, S8 Sound Camp, S8 Video App, Galaxy S8 Internet Beta app and S8 Translator. Download Samsung Galaxy S8 Apps for Samsung Devices from below. These Samsung Galaxy S8 stock apps are working perfectly on Touchwiz Nougat and maybe working on Android Marshmallow also. These are all the Samsung Galaxy apps which are available for now. We will share the more apps as soon as it will be available, until then Download Samsung Galaxy S8 Apps and share it with your friends.